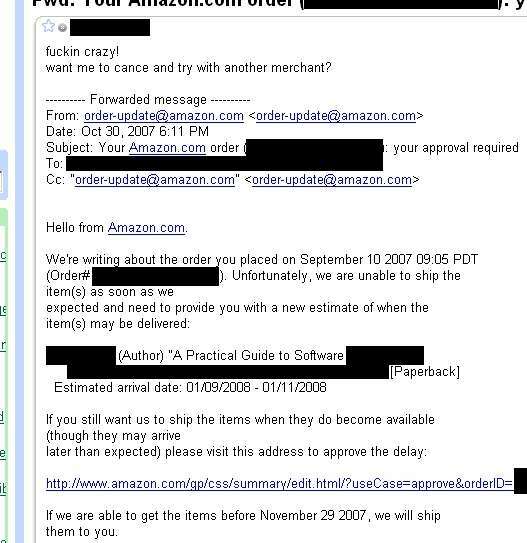 The order was submitted on September 10, 2007. It was previously delayed until sometime between October and November. Now, the delivery date is estimated at January 9 to January 11 of the following year! Amazon is amazing. I’m afraid that if we stick around again, they’ll just move the delivery date another quarter. I simply want the book at the agreed price in the agreed condition that was determined at purchase. So, it looks like I’ll have to accept the delay. This entry was posted on Tuesday, October 30th, 2007 at 6:14 am	and is filed under - blah -. You can follow any responses to this entry through the RSS 2.0 feed. You can skip to the end and leave a response. Pinging is currently not allowed.